A Collaborative wine from a shared cellar. Refreshing and delicious for spring and summer. Made in Castlemaine from Pinot Gris, Riesling, Viognier and Chardonnay from five sites around Central Victoria. The boys reckon they've hit the nail on the head with this one. Lovely natural acidity and very little sulphur additions. 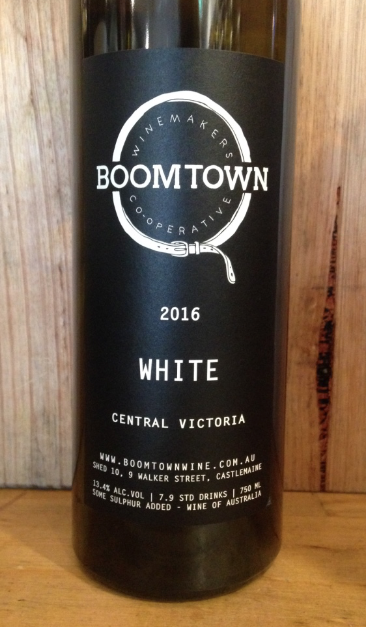 "2018 Boomtown White is a continuation of our developing theme; drinkable, refreshing whites that are non-varietal yet distinctly Central Victorian. Mount Alexander Pinot Gris and Metcalfe Riesling do most the work this year, both granitic sites, with a splash of barrel fermented Chardonnay and carbonic macerated Viognier to add presence and push dimensions. Coming in at a super fresh 12.1% alc.vol with crunchy green apple acidity, the 2018 White is a leaner expression than previous offerings yet still show varietal ripeness and texture." - Boomtown Wine Co-Op.